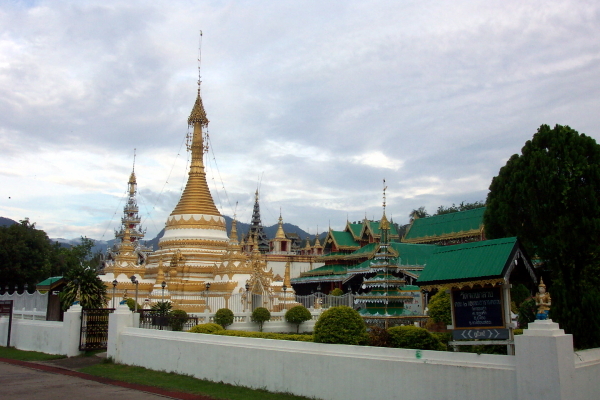 Set on the south side of Jong Kam lake in the middle of town, Wat Jong Klang's white and gilded chedi has practically become a symbol of Mae Hong Son. Behind the chedi is a large rambling open-fronted wiharn. Within the wiharn are many altars and throne-like pulpits used by the monks of the temple when giving sermons. 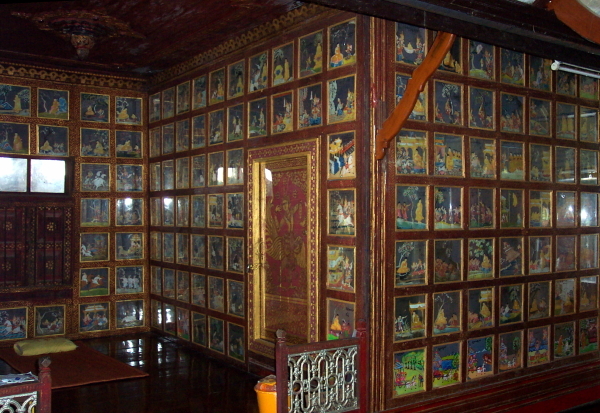 To the right of the altar, three walls are completely covered with small paintings on glass depicting the previous lives of the Buddha (the Jakata). The paintings are more than 100 years old and were bought from Mandalay in Burma. In a room behind the paintings is a collection of small wooden 'dolls' also bought from Burma. This was closed for repairs in May 2003.